DC Office Kamrup Latest Recruitment 2018, Helper Posts in NRC Updation Process :- Hello Assam career Job aspirants. DC Office Kamrup has published a recruitment notification for the month of July 2018. According to the latest DC Office Kamrup Recruitment 2018, A walk-in-Interview will be held on 26th July 2018 from 11 AM onwards at the office the Deputy Commissioner, Kamrup, Amingaon, for engagement of Helper (On contractual basis) in connection with NRC Updation process under Kamrup District. We have discussed more about this govt jobs in Assam below. 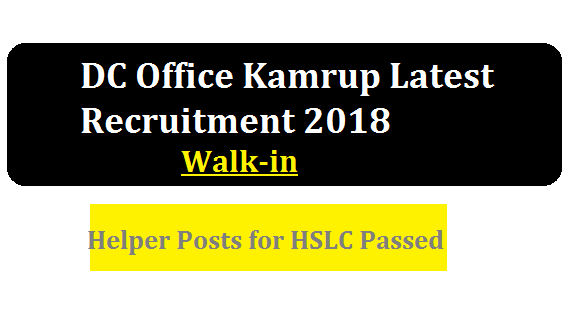 In this section, we will discuss in detail about Recruitment of Helper Jobs under DC Office Kamrup Assam Recruitment 2018 with all the details and requirement. Educational Qualification: Candidates must have passed HSLC/10th from a recognized institute or school. Interested candidates may appear in walk-in-Interview which will be held on 26th July 2018 from 11 AM onwards at the office the Deputy Commissioner, Kamrup, Amingaon. Candidates should bring both their original & Xerox copy of documents relating to educational qualification, age proof certificate, address. proof, other certificates and two passport size recent colored, photographs at the time of interview. 1/ The Deputy Commissioner reserve the right to reject any or all applicant without assigning any, reason thereof. 2/If any more vacancy arises whether in District/Circle level under Kamrup District for the post of “HELPER” in connection with NRC Updation process within 6(six) months from the date of publish of this advertisement, then the further engagement Will be made from the merit list of the candidates who will appear in the interview vide this advertisement. 3/Candidates shall have to appear in the interview at their own cost. 4/ No TA/DA will be provided to the candidates for appearing in the interview.